General Election Results: Eleanor Laing for the Conservatives retained the Epping Forest District Seat which covers our village with an increased majority. Her percentage of the vote increased by 5% and the Labour Party's share dropped by nearly 8%, the Liberals did not show the same sort of increases in votes in Epping Forest in comparison to other parts of the country, the smaller parties picking up the remainder of Labour's loss. Full results below. Latest March & April Neighbourhood Watch/Beat Mobile Newsletters: are now on site Click Here to keep informed about the latest security issues in our village. St. Mary's Events: St. Mary's have two fund raising events in May. On 21st from 10am - 2.00pm there is a Plant sale giving the opportunity to make your garden look good for the coming season or maybe even to prepare for Open Gardens Day. 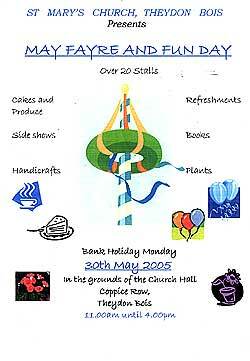 On the 30th May from 11am - 4.00pm they are holding a May Fayre with over 20 stalls and plenty of fun events for all the family. Music Society Premier: Theydon Bois Music Society goes from strength to strength and this is now recognised by some of the excellent musicians who now play at their monthly evenings in the village hall. Last Thursday 14th April as part of the programme of the flute and piano concert performed by Emma Williams (flute) & Richard Shaw (piano) the world première of a piece by the well known American Composer Gary Schocker took place. Even better the lady who commissioned the work called 'Hannah's Glade' was in the audience and explained to our music lovers the inspiration for it. She had always considered Ralph Vaughan Williams 'The Lark Ascending' her faourite piece of music but this cannot be transposed for the flute so she asked the composer that the new work should be inspired by this and the photographs of the woodland glade near her house in Kent. It certainly proved to be an enjoyable work reflecting the sights and sounds of the English Countryside and fitted well into a programme of Mozart, Bach Bizet and Debussy. 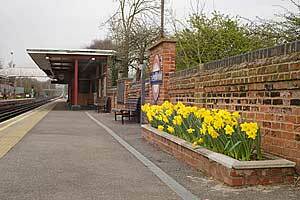 Spring Daffodils: Commuters journeys to and from Theydon Bois Station have been made pleasanter over the last few weeks by the magnificent displays of springs flowers. Planting was carried out by our Parish Councilors and helpers so our thanks is due to them. 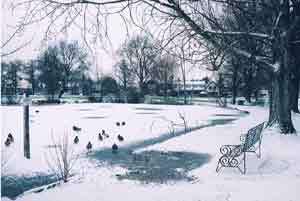 It may be Spring now but.....:its not many weeks ago that the village was covered in snow. Gary Lashmar who lives in the village sent us some excellent photographs of the very pictorial look. With Gary's permission we have now added these to our photo galleries for you all to see. Click Picture to go to Gallery. Dai Jones from Aberaeron in Wales found this early postcard (Edwardian?) about which he didn't have any details, so he looked Theydon Bois up on the Web and was then kind enough to send us a copy. 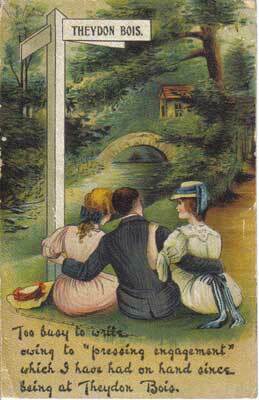 The text on the card reads; Too busy to write owing to "pressing engagement" which I have had on hand since visiting Theydon Bois. I think this behaviour has stopped since the introduction of CCTV here? 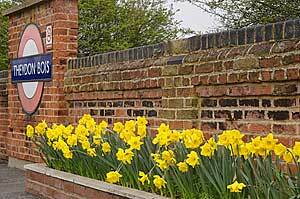 Parish Council Minutes:Parish Council Meeting Minutes for the 31st March 2005 are now on line Click here. Village News March 2005 Issue 49: The full colour pdf of the latest issue is now available to download Click here. January/February 2005 (Word 1.4mb approx 6 mins@56K). Activity Area: You will have noticed that the Toilet Block on the Green has now been demolished. This was the site proposed at the last Parish Council Meeting for an Activity Area for the youth of the village, but was subject to approval from the Corporation of London. 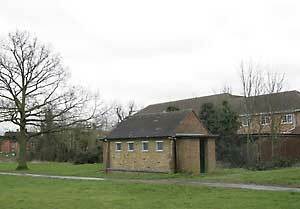 At their meeting on 7th March The Corporation of London advised the Parish Council that it was unable to support an such development on the Village Green. The Parish Council is now looking for suggestions for an alternative site and in the meantime the planning application has been put on hold. Parish Council Dates: Parish Council Public meetings 31st March, 26th May 2005. Litter picks 9.00 pm at the Village Hall Saturdays 2nd April, 7th May, 4th June 2005. Community Bus: Please note that the Community Bus which was featured in the December edition of Village News runs on Monday and Friday and not Monday to Friday as previously stated. The Parish Council would like to apologise for the error. For further information regarding the service please telephone Epping Forest Community Transport on 01992 564040. Play Tennis Like Tim Henman and Dance Like Fred Astaire: If you thought joining a tennis club meant just playing tennis, you would be wrong. Over the Winter, the club has run golf days, quiz evenings and most recently, Strictly Come Dancing on a Friday night at the Scout hut. This has been open to non members, and builds on the success of the BBC's Strictly Come Dancing. Professional tuition has been on hand every week and has proved very popular. The club will be running this again in the Autumn, so watch this space. Not only is the Tennis club teaching members to dance, it is also teaching them to play tennis. Junior Coaching is more popular than ever. Saturday morning coaching sessions during the winter have seen anything up to 40 children attending the group lessons on offer for 5 to 18 year olds. Friday evening Junior lessons will also start after Easter and run until October so that there will be space for more children to learn how to play. The Tennis Club is looking open up the facilities to far more villagers in 2005 and is keen to offer adults, not just children the chance to learn to play tennis. With this in mind, adult evening lessons will also be on offer on Tuesdays evenings after Easter, so people who work during the day can come along. Places are limited and if you are interested in coming along, please contact Ian Smith in 01992 573601 or go along to the club. NEW TREES IN THE VILLAGE: Under the Theydon Bois Community Tree Strategy Scheme we have now completed the planting of the new trees for the 2004/2005 planting season. In liaison with the District Council and Country Care (EFDC), who provided 11 of the trees, a further 11 were paid for by locally, 8 of these are Memorial trees paid for by residents in memory of loved ones , we are most grateful for this support, the balance paid by the Parish Council. There is a plaque displayed in the Village Hall which displays details of those ho have contributed for a Memorial Tree. Pyrus and Birch, all of a type suitable for road verges and planted with root barriers and watering tubes. 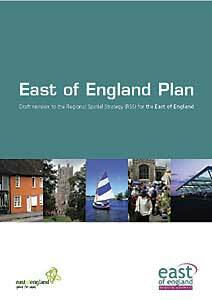 The Strategy extends over a 5 year period, it is proposed that the committee will meet later this year for the annual review and decide on our programme for the following year. We shall do our best to continue to enhance the Village for the benefit of our residents. Theydon Bois Parish Council, Theydon Bois Rural Preservation Society, Theydon Bois tree wardens and The Corporation of London: Conservators of Epping Forest. Report from: Wilfred Shales and Jane Turner- Tree Warden. 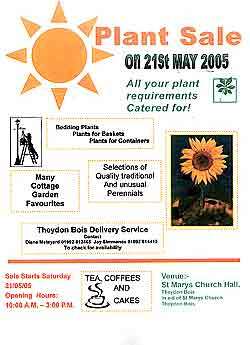 Open Gardens Day: 25th Anniversary Year. After years of organising Open Gardens Day Joy Wainwright is taking a well earned rest and this year the task has fallen to Carole James. This year will be the 25th year for Open Gardens Day in our village and Carol is sure that the village gardeners will be working hard as usual to put on magnificent displays. So far we have 22 gardens opening on the day, if you would like to open your garden for this event or want further information contact Carol. Tel: 01992 812250. Note the date in your diaries: 11am - 5.00pm SUNDAY 26th JUNE.